NETWORK FINALS: The rerun of SINGLE PARENTS lost 0.1 in final numbers. CABLE HIGHLIGHTS: ESPN’s NBA doubleheader led Thanksgiving Eve cable at 1.40/1.16, and the early evening COLLEGE BASKETBALL game was at 0.72. Hallmark’s movie REUNITED AT CHRISTMAS was at 0.45. Bravo’s REAL HOUSEWIVES OF NEW JERSEY lost 0.04 to 0.36, and REAL HOUSEWIVES OF DALLAS was down 0.02 to 0.21. On History, FORGED IN FIRE ticked down to 0.33, and KNIFE OR DEATH ticked up to 0.19. 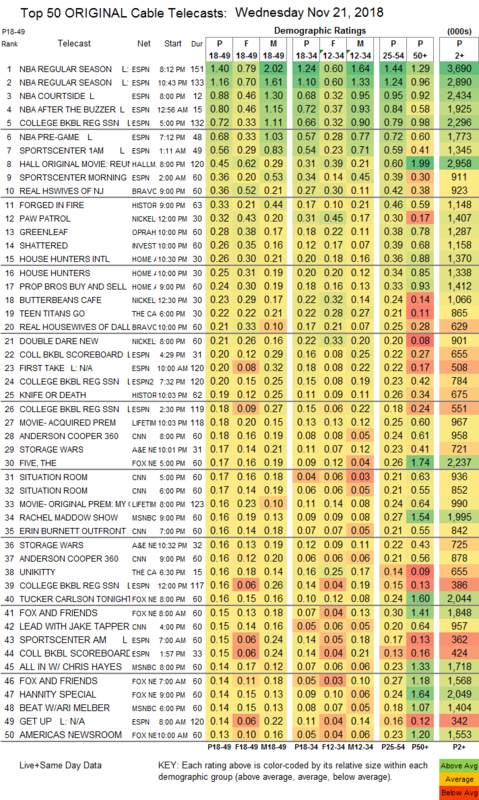 Nickelodeon’s noon PAW PATROL was at 0.32, with lead-out BUTTERBEANS CAFE at 0.23. The season finale of OWN’s GREENLEAF rose 0.03 to 0.28, which was down 0.07 from the 2017 finale. On ID, SHATTERED dropped 0.04 to 0.26. On HGTV, HOUSE HUNTERS INTL climbed 0.04 to 0.26, HOUSE HUNTERS ticked up to 0.25, and PROPERTY BROTHERS was down 0.04 to 0.24. Food Network’s MACY’S THANKSGIVING CAKE CHALLENGE was at 0.23. Cartoon Network’s early evening TEEN TITANS GO was at 0.22. 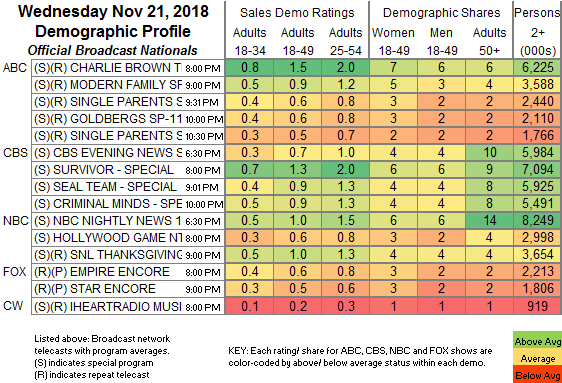 Cable news was closely packed, with MSNBC’s RACHEL MADDOW SHOW at 0.16/0.27/2M, CNN’s ERIN BURNETT OUTFRONT at 0.16/0.21/800K, and Fox News’s TUCKER CARLSON TONIGHT at 0.16/0.24/2M. IFC’s STAN AGAINST EVIL held at 0.05/0.04. The final episode of AMC’s THE LITTLE DRUMMER GIRL was at 0.05.